Ranking Roger, Frontman For The English Beat, Dies At 56 In the late '70s, Ranking Roger left punk rock to join The Beat — later known as The English Beat. His presence helped it become one of the most unforgettable bands of the '80s. 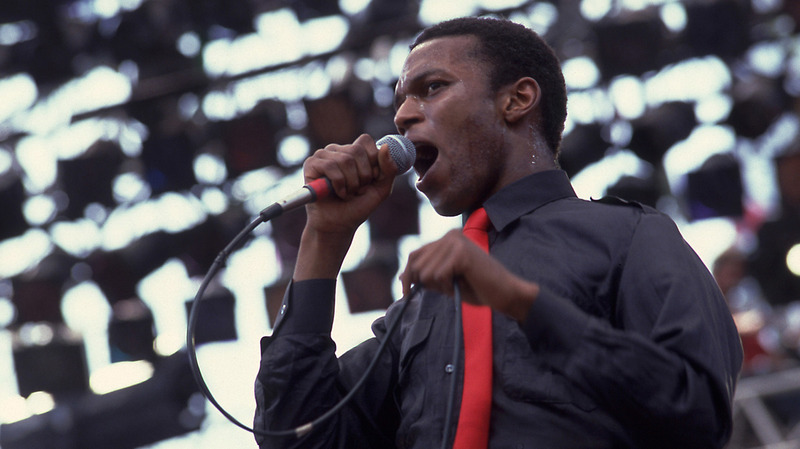 Ranking Roger, born Roger Charlery, performs with The English Beat in San Bernardino, California, on May 28, 1983. Charlery died March 26, 2019 in Birmingham, U.K.
Roger Charlery, best known as Ranking Roger, singer of the widely influential U.K. group The Beat — known as The English Beat in the U.S. — died Tuesday afternoon, at 56. The singer was diagnosed with brain tumors and lung cancer last year. His death was announced on the website of The Beat, and confirmed to NPR by the group's manager, Tarquin Gotch. Charlery was born Feb. 21, 1963 in Birmingham to parents of the so-called "Windrush Generation" — a migration of citizens from the Caribbean commonwealth to the mainland that began in the late 1940s. Less than a year later, The Beat had reached the Top 10 of the U.K. charts with its cover of Smokey Robinson and The Miracles' song "Tears of a Clown," and "never looked back," Charlery said. The group would go on to release four more Top 10 singles and two Top 10 albums in the U.K.
As the group's profile waned in the U.K., its fortunes rose in the U.S. The original group's final album, 1982's Special Beat Service, was its highest-charting record stateside, but its lowest in the group's native country. (That record contained what's arguably the group's most indelible song, "Save It For Later.") In his memoir Siren Song, famed label executive Seymour Stein remembered securing the group's North American rights and putting the band on tour with Talking Heads and The Pretenders, "double bills that never failed to blow away audiences everywhere they played." By 1983, however, The Beat had dissolved. Charlery and Beat co-founder David Wakeling formed a new group, General Public, while co-members Dave Steele and Andy Cox founded Fine Young Cannibals, which had its own run of success through the rest of the decade. Charlery continued to work up until the very end — including a 2003 Beat reformation, which led to a fresh iteration called The New English Beat featuring Ranking Roger. At the time of his death, Charlery had recently finished work on his biography, I Just Can't Stop It, and had released a record this past January, titled Public Confidential. "Ranking Roger was a lion, and a lovely, lovely man, and I consider myself extremely fortunate to have shared my life with him — just as all his band mates, both past and present, felt lucky to have shared the stage with him," manager Tarquin Gotch writes in an email to NPR. "We all are overcome by grief." This article originally misidentified the "Windrush migration" as having begun in the early 1950s — it began in late 1940s.